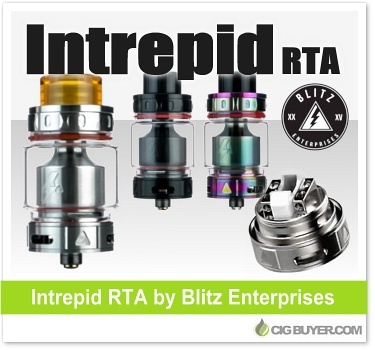 Combining quality manufacturing with a versatile 24.5mm design, the Intrepid RTA by Blitz Enterprises is a high-performance rebuildable tank atomizer that features a fully customizable airflow system and an elevated postless build deck to accommodate virtually any coil configuration. A ceramic plug allows for either single or dual coils, and the dual slotted airflow feeds directly into the chamber for superior cooling properties. The Blitz Intrepid RTA Tank can hold up to 3.5ml of e-juice and includes a convenient hinged top-fill design with three (delrin, ultem and resin) 810 drip tips.